DIGISOL Systems celebrates its one year of successful Structured Cabling business. To mark 1st Anniversary DIGISOL organized nationwide celebration with its distributors and partners. 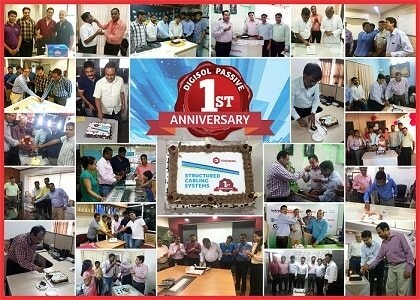 Speaking on this occasion Shailesh S. Bhayade, VP – SCS Business, DIGISOL Systems Ltd. said, “Today as we celebrate our first anniversary, we are very excited to see that over such a short period of time we have made tremendous in-roads in this highly competitive marketplace. We are thankful to all our channel partners & SI customers who have believed in us & shown confidence in DIGISOL SCS solutions”. DIGISOL’s cabling portfolio includes Copper cabling solutions (Cat5e, Cat 6 & Cat 6A), UTP/STP LAN Cables, Keystones, Patch Panels, Patch Cords, Face Plates etc. The Fiber range has Fiber cables, Fiber Patch Cords, Pigtails, LIU couplers and an entire FTTH Product line. DIGISOL cabling products adhere to EIA/TIA and ISO/IEC international standards. They are RoHS compliant and are backed by international 25 years product warranty performance. DIGISOL Structured Cabling Systems is here to fulfil the network connectivity needs of medium to small businesses and home networks, as well as SME & Enterprises requirements. DIGISOL’s 1st successful year of Structured Cabling Business 0 out of 5 based on 0 ratings. 0 user reviews.